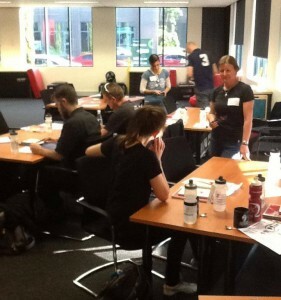 I’ve just returned from Melbourne where I attended a training course with US bike company Specialized. I attended the course because I recently took on a full-time role at Ashfield Cycles. The course was excellent and run by a great team at Specialized and I found it particularly encouraging that there were six women (out of 13 total attendees) sharing the three days. According to Emma Mackie who coordinates the courses for Specialized, this was the most number of women that have ever attended this training course. Typically there are usually one or two on each course. I took this as an encouraging sign that things are changing in the bike retail industry. I doubt that every course will be nearly 50/50 men and women but it’s a sign that there’s a slow change occuring. As any keen cyclist will tell you, most bike shops are full of male staff who are pretty good at meeting the needs of cyclists of all kinds but not always great at serving the needs of female cyclists. Of the six women, me being one of them, we come from different geographic locations, backgrounds, ages, but share the common love for cycling. Let me introduce them to you. Trina is from Cairns and has worked for Pump ‘n’ Pedals for the past 18 months. She’s a reformed interior designer who loves working in the bike shop and sees it as a ‘lifestyle’ job. Her passion for cycling and particularly mountain biking is what keeps her smiling when she’s working in the store – a happy place to work. Rosey from Christchurch NZ has recently completed a degree in Sports Coaching and now works full-time in Chain Reaction Cycles. She’s loving the fun workplace and sees it as a viable career, particularly with a supportive boss who among other things has sent her to Australia to attend the course. Like me she’s a keen roadie and races both road and track. Catherine is also from New Zealand and works in the Specialized NZ office as well as working casually in several Specialized stores. Catherine is a keen roadie and has been riding for about six years. She has also recently started mountain-biking. She thinks that the bike industry is fantastic and actively encourages more women to join her in cycling and working in the industry. Lisa from Brisbane works part-time at Planet Cycles in Woolangabba. She’s a keen mountain biker and currently competes in downhill at national level and cross-country at state level. She’d love to continue her career in the bike shop but has recently signed up to join the Army to give herself employment stability. Gill from Townsville has an admin role at Top Brand Cycles and works on the shop floor when required. Since joining the shop she’s increased her road cycling with a bike upgrade. She used to ride one a week with a strong focus on a cafe visit. She now rides four or five times each week and is aiming to complete the 100 km road race from Charters Towers to Townsville next year. She believes that the bike industry offers viable career paths for women and plans to stay put until she retires. For me, I’m feeling like part of a change in the Australian cycling scene. This is being led by companies like Specialized which employs plenty of women in many different roles. Earlier this year Specialized also started a course that is women only and covers many aspects of Specialized’s range but is tailored to the needs of women, who can often feel intimidated learning alongside men. Meeting all these great women last week made me feel encouraged that the future is bright for women who want to join the cycling industry. It’s not just a job you take because your dad or husband owns a bike shop, but a real career opportunity for women. My hope is that other women who read this are encouraged to consider a career in the Australian/New Zealand cycling industry. What have your experiences been in bike retail? Trina here- love your article and it was lovely to meet you. I am pleased to tell you I am going to the women’s only class! Yay! I’ll keep you posted. Our shop- Pump n Pedals- is having a huge Specialized Women’s Ride Month for October as well, and yes I will be doing the road rides as well!! Keep riding girls- it’s ‘freeing’ and fun!